The Tech Institute today is hosting 150 women entrepreneurs from the D.C. area for an all-day workshop on "Start-Up Law 101". The program, hosted through our work on BEACON: The D.C. Women Founders' Initiative, brings together over 30 speakers on topics ranging from business formation, to protecting your unique idea, to partnerships and contracts and privacy concerns. 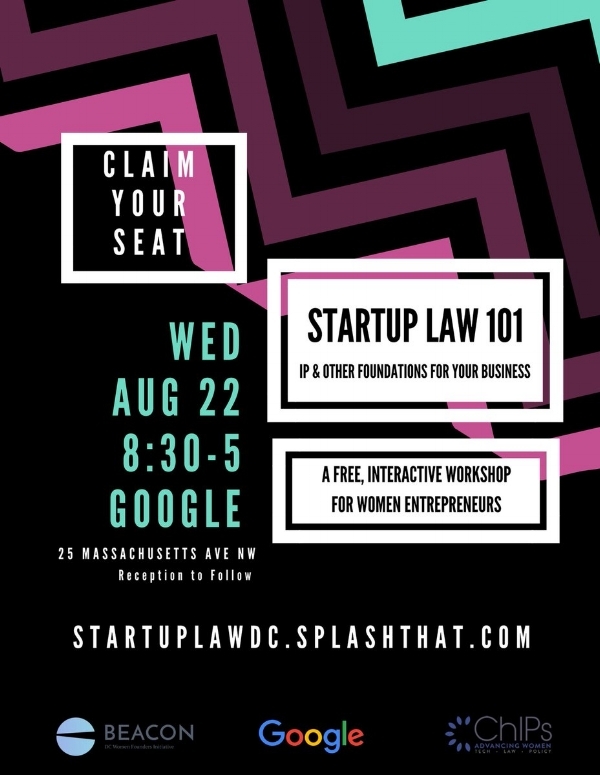 This is our second year hosting StartUp Law 101 in partnership with ChIPS, the women in technology network and Google, which made its D.C. public events space available for the day. The program features law firm attorneys, in house counsels, former SEC regulators, privacy experts, and other lawyers, explaining the key legal issues a founder faces as they launch their business and scale. The event also includes a panel of entrepreneurs sharing their stories of overcoming legal hurdles, and a panel of legal resource providers describing how founders can find (and work with) legal help. Georgetown Law's Social Enterprise and Nonprofit Clinic will present its work providing legal assistance to social enterprise organizations in the D.C. area. The Institute is publishing a Resource Guide for D.C.-area Legal and Business Clinics in connection with the event. Today's event is part of the Institute's work on BEACON: The D.C. Women Founders' Initiative, which studies and develops strategies to promote a diverse and inclusive ecosystem for women entrepreneurs. Incubated at the Institute and staffed by a full-time Georgetown fellow, BEACON works in partnership with the D.C. Mayor's Office and other local leaders. Its work has been featured by the National Women's Small Business Center and the U.S. Senate Committee on Small Business and Entrepreneurship. You can read BEACON's recent report, "Building Inclusive Ecosystems With Intentionality: A Strategy to Support D.C.'s Women Founders" here. Visit the StartUpLaw 101 Event Website here to view highlights from the day.